Welcome to my first comic review. Here is how it’s going to work. Each week I will read the comics that I get and rate each one on a scale of 1-5, then pick one to review in depth. Most times the comic I will review will be what I think is best that week, other times it will be the worst. Additionally, any comic that gets a rating of 4/5 should be considered on par. Ratings of 5/5 will be given to books that I think are going above and beyond the expected story. If anybody disagrees with my ratings, I am open for discussion at most times. I am always willing to voice my opinions and debate. Also, you may notice that I concentrate on DC Comics. For this first article, I will rate all of the issues 1’s of “The New 52” that I am currently getting. Since both issues 1 and 2 are out for all my titles the next article will rate number 2’s. After that it will be a weekly thing with only a few issues on each list. For now though I’ve got a lot of ground to cover! As you can see a few issues earned a perfect score. When “The New 52” came out I had no idea what to expect, but I went in with an open mind. The one that exceeded all of my hopes was Aquaman. Maybe being written by Geoff Johns has this effects on superheroes who aren’t as popular. 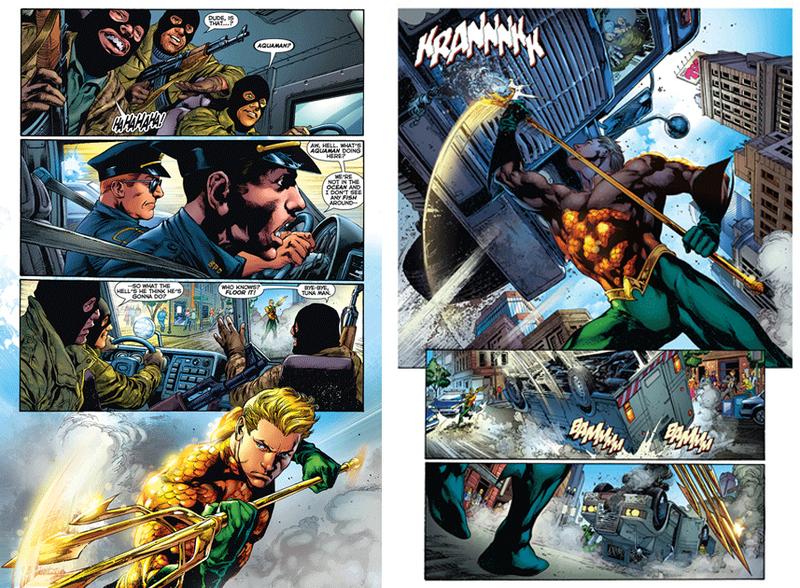 Years ago, I was one of the masses that considered Aquaman to be a useless superhero, all he could do was swim well and talk to fish. I hadn’t really read that much Aquaman, but after reading this first issue, it made me realize that I was missing out on one of the better stories in the DC universe. It’s people like me that Geoff Johns was obviously trying to prove wrong in this issue. The first half of the book shows Aquaman interacting with the world and the world looking on in confusion. He stops an armored car robbery, kicks the crap out of the robbers and gets shot all in the first few pages. The whole time he has to listen to people’s misconceptions about him. They ask him if he talks to fish, and wonder why he is so far away from the water. Basically think of a group of people that only know about Aquaman from watching “Super Friends.” It’s almost as they expect him to come riding in on a giant seahorse. There is even a guy that asks Aquaman while he is sitting in a restaurant, “How’s it feel to be nobody’s favorite superhero?” To which Aquaman quietly picks up his trident and leaves. And all throughout the book you see these creatures that look like humanoid angler fish rising up from what they call the “Trench.” I don’t know about you but those kind of fish with the huge eyes and uneven teeth creep me out to no end. And I love it; this looks like the making of a horror/action arc that will hopefully introduce a new group of enemies to DC. It’s almost if Geoff Johns was using this first issue to dispel all of the stereotypes that have surrounded Aquaman for the last 30 years or so. For that he has my thanks. I think it is good for DC to try to promote what we would consider their “B List” heroes. For too long the Dark Knight and the Big Blue Boyscout have had center stage. Green Lantern had his revival and so has The Flashl it’s about time that we start to focus on heroes that have never been offered a movie deal. 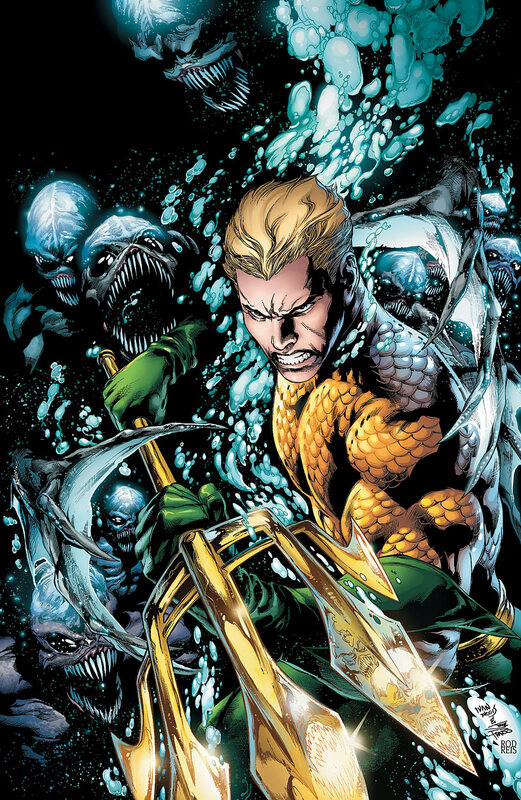 Get Aquaman’s name out there, give him a crossover series like “Blackest Night”. Maybe it’s just the fact that I’m sick of Batman. Maybe I’m still resentful that the “Green Lantern” live action movie didn’t do that well. All I know that it’s refreshing to see a hero take his criticism in stride and still go on to save the day. Every person reading this article should go out and buy “Aquaman” number 1. It only costs $2.99 (thank you DC). I’m just saying give the issue a chance, and you will be surprised at how much you enjoy a guy in a fish scale shirt and green pants flipping an armored car like it was a tinker toy. Disagree? Agree? Sound off in the comments. Or on our Facebook or Twitter pages.